Traveling is my passion. I am addicted to being on the move, so when I started COLORES Collective last April (2017) it was so many parts of my life coming together to create a business that I never thought I could have. My travels and experiences are what make COLORES unique, and even though the brand will always be evolving- the journey getting there is proving to be the best part. I am fortunate to be able to travel to so many unique places, and a husband that puts up with carting around overstuffed suitcases across the globe. Being able to experience these places with him, for my business brings me immeasurable joy and the greatest sense of satisfaction. So, with all that being said-I wanted to start a travel series of "COLORES Around The World" that will serve as a brief, but visually rich overview of the places that we go. 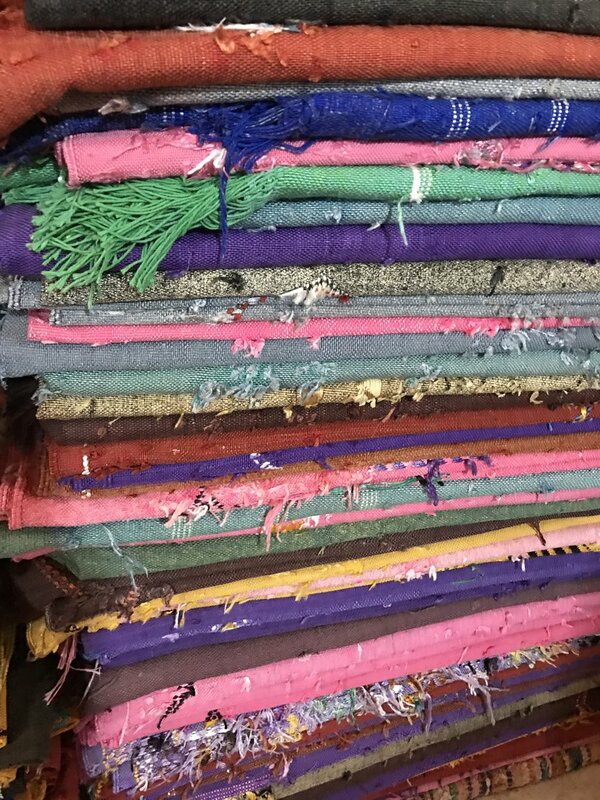 It will allow you to see not only beautiful places around the world, but an insight into how COLORES collections are made, how they are sourced and what goes into the simplest bag/tassel/caftan or tote. I thought it was only fitting that I start with Marrakesh- Enjoy! Marrakesh in July is Hot- I mean hot hot- so the pool brought some welcome relief. When you just want to bring home the tile. On this particular trip I had no idea what we would (or wouldn't) find so at the end of our first sourcing day I was like a kid in a candy store. This mini pom pom clutch was an automatic favorite. Every night at dusk, they bring out the lanterns and lay out the rugs. Like something from a movie, this historic building brings old world French style (read; cafe chairs, double staircases, deep rich wood ceilings, classic jazz) with the classic Moroccan food and feel. Interior courtyard of the Ben Youssef Mosque built in 1070. Hand carved metal chandelier in the central courtyard of Marrakech Museum. Looking down never looked so good. We spent over 4 hours looking at hundreds of rugs, only choosing a specific few to bring home. Moroccan Kilim rugs are so special. They are made from 100% cotton that is spun in a specific way that makes it incredibly durable. The embroidery is all done by hand with cactus fiber. Not my finest look but after our rug expedition they made us lunch on the rooftop and it was fantastic. The Medina is like a maze of roads that have beginning and no end. Google maps can'e even save you. Morocco has quite a few vineyards that make great wine- this being one of them. Our guides and their donkeys. Our guide brought us to his families home where they made us lunch. The rug you see in the background are popular in the region and are made from scrap pieces of fabric. They don't believe in wasting any resources, no matter how small. I'll let the food do the talking. This is what most of the buildings look like in this particular part of the Atlas Mountains and they haven't changed in hundreds of years. I find it incredible and inspiring. But, when in such a beautiful place, with a new collection of Caftans- you do what you gotta' do! La Mamounia is a special hotel that is deserving of its own category, and heading. Situated in the middle of the city, its more of a fortress than a hotel. The walls surround what has to be at least a few acres of land that lead you though gardens, to courtyards, spas to pools, tea rooms to restaurants. When your staying there, everything else really does fade away. The sound of motorcycles become bird songs, dirty streets become gravel pathways, so on and so on. I'm usually not one to share hotel rooms but these rooms were exquisite. From the perfect colors, rug details, bottle of wine, tile inlay and original doors leading to private balcony- perfection. The detailing on the foreground wall is all hand laid stone. The juxtaposition of that detailing with that of the Caftan was a perfect example of how the culture manifest in both fashion, architecture and beyond. I loved the way the trees turned colors at nightfall. A shameless elevator selfie (which I wish you could see better- the leather lined walls and antique details made it reminiscent of a jewel box). Part 2- YSL Gardens + More Coming in the next week.